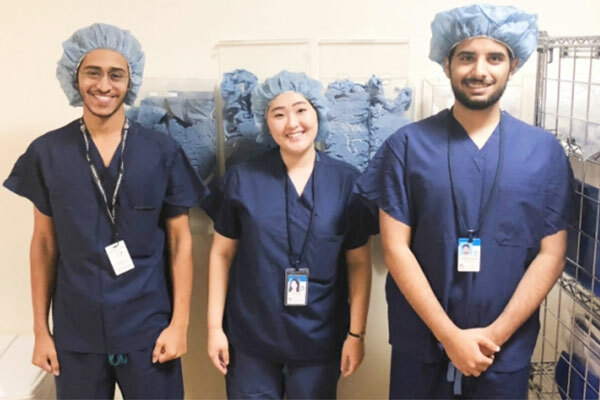 Two Khalifa University students have developed prototype apps for patient care as part of their internships at the Sheikh Zayed Institute (SZI) for Pediatric Surgical Innovation at the Children’s National Medical Center in the US. The two apps – Online Treatment Recovery Assistant for Concussion in Kids (OnTRACK) and BearGenes – were developed by computer engineering students Hazza Daiban and Mohammad Al Mansoori during their eight-week internship in Washington, DC. The students worked under the guidance of Kevin Cleary, PhD, Professor of Radiology, Surgery, and Pediatrics at George Washington University and leader of the Bioengineering Initiative at the Sheikh Zayed Institute. OnTRACK was developed with Gerry Gioia, PhD, director, Safe Concussion Program, while BearGenes was developed with Natasha Shur, MD, and Marshall Summar, MD, from the Children’s National Rare Disease Institute. The OnTRACK mobile app prototype that Daiban worked on is intended to help in concussion management by using ecological momentary assessment (EMA) of symptoms and to prompt patient treatment strategies. It is designed to provide support for patients five years and older who are identified with concussion. The developers are keen to incorporate the feedback currently being received from end users. The BearGenes mobile app prototype that Al Mansoori worked on is designed to provide a trusted educational and informative platform for the patients and the public about genetic counselling and genetic conditions. It also provides information on where to access genetic expertise, such as the Children’s National Rare Disease Institute. The team is planning to create a web version of the platform that will be linked with the mobile app. Videos and information are being created by Children’s National Rare Disease Institute and will be added to the mobile app prototype database. Once uploaded to Play Store and App Store, mobile devices with the app will be offered to interested patient families. Dr Cleary leads SZI's interdisciplinary bioengineering team and focuses on technology development for paediatric medicine, working with the clinical team and other colleagues at Children’s National.